Get your little ones in the back-to-school spirit with this cute bus. 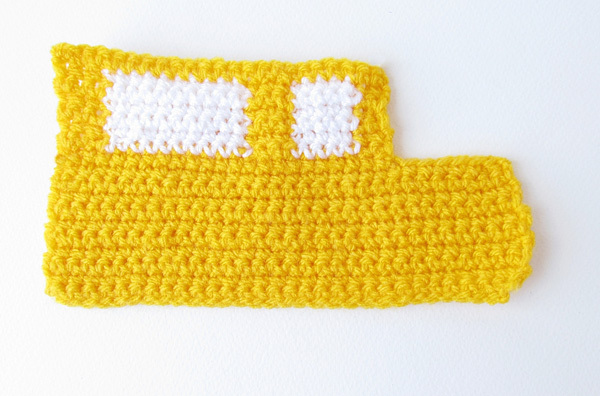 Check out these step-by-step instructions on how to make your own amigurumi school bus! After turning at the end of each row you will ch 1. 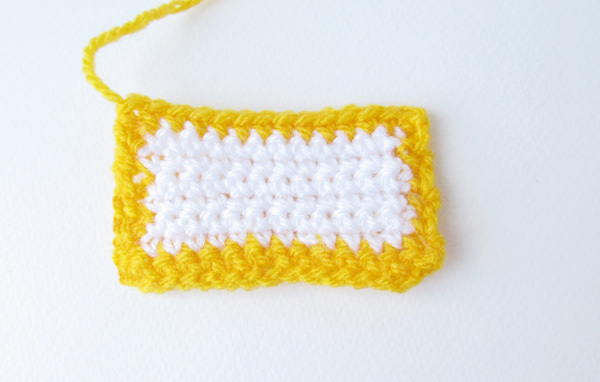 This pattern calls for switching from one color to another, but there is a trick to doing it so the change in color is very clean. Stitch up to two stitches before you are supposed to change colors. In the next stitch (the last one of your current color), do not pull the final loop through. Instead, loop the new color around your needle and pull the loop through. Now, just stitch as usual. For this pattern you have to change colors in the middle of the row. I carried the first-color yarn along the back side while crocheting with the new color, so that first color popped right out when needed, Make sure you leave enough “carried along” yarn along the back. Otherwise your project will start to lose its shape and “shrink” as the yarn tightens. Make two sides, starting with yellow. R1: sc in second ch from hook, turn (30). R2-8: sc in each ch across, turn (30). R9: ch1, sc 26 sts, sc2tog in last st (28). Holding the piece facing you, attach yellow in 7 ch from fastening-off point. R1: sc in each ch across, turn (23). From now on you will need to change colors. Use the technique described above. R2: with yellow sc 3, attach white sc 10, with yellow sc 3, with white sc 5, with yellow sc 2 (23). R7: using yellow, sc 23 (23). R1: sc in second ch from hook, turn (14). R2: with yellow sc 1, with white sc 12, with yellow sc 1 (14). R9: using yellow sc in each st across (14). Make four, starting with gray. R1: ch 2 then make 6 sc in second ch from hook (6). R2: 2 sc in each stitch around (12). R3: 1 sc, 2 sc in next stitch, repeat 6 times (18). R4: 2 sc, 2 sc in next stitch, repeat 6 times (24). R5: 3 sc, 2 sc in next stitch, repeat 6 times (30). R6: sc in each stitch around (30). R7: 1 dec, 3 sc, repeat 6 times (24). R8: 1 dec, 2 sc, repeat 6 times (18). R9: 1 dec, 1 sc, repeat 6 times (12). Finish off and fasten off. Before closing, remember to stuff firmly. Use white cotton thread and a 3.00 mm hook. R1: ch 2. then make 6 sc in second ch from hook (6). R3: sc in each stitch around (12). Use red cotton thread and a 3.00 mm hook. R1: ch 2, then make 6 sc in second ch from hook (6). Make two bumpers, using black yarn and 9.00 mm hook. R1: sc in second ch from hook and in each ch across (14). Use orange yarn and 3.5 mm hook. R3: 1 sc, 2 sc in next stitch, repeat six times (18). R4:1 dec, 1 sc, repeat six times (12).